Of these six forms, four are always used to refer to "persons" in the philosophical sense of conscious beings (not necessarily Homo sapiens) -- the first and second person forms (i.e. you never address a rock, calling it "you," unless you mean to imply that it is somehow a conscious person). (Things are going to get confusing with using both the grammatical and philosophical definitions of the word "person" from here on out, but bear with me.) And of those four always-persons, three now use the conjugation "are." Singular they looks to become more and more common. More people are coming out as nonbinary (and thus not willing to use the two gendered third person singular pronouns "he" and "she", nor the one non-person pronoun "it"), and singular they seems to be eclipsing neopronouns (such as xe or zie) in this context. We're also seeing more use of singular they in place of "he or she," "he/she," and "he which I'm using to refer to people of all gender because it's easier and since I put this disclaimer in you can't call me sexist." And we're seeing a broadening of the circumstances under which we treat a person's gender as unknown rather than assuming that "he" or "she" applies. So my projection is that singular they will become standard for all persons, leaving he and she as historical relics (like thou). "It is" will be retained for non-persons in the singular. Now, "are" has become the conjugation for an even larger percentage of persons (in the philosophical sense). The only exceptions are the retention of "am" for first person singular, and the use of "they are" for all third person plurals, whether persons or not (i.e. you'd say "they are" about a group of people as well as about a group of rocks). Expanding to "I are" is fairly straightforward. To distinguish persons and non-persons in the third person plural, we need to make a side-tour into pronouns. And if "to be" is shifting to distinguish persons from non-persons in conjugation, we could expect the same to happen with the rudimentary conjugation that remains in other verbs. We're already seeing a bit of this in the way that people playfully attribute personhood to non-humans in meme culture. It's common currently to use "he" or "she" as a way of attributing personhood, but it is often followed by a conjugation that lacks the normal third person singular s. We get expressions like "he eat the banana." This could be interpreted as a desire to standardize conjugations according to personhood (in the philosophical sense), not grammatical person and number. This article makes some good points about the failures of science fiction in using allegory to address bigotry and oppression*. But I think there's a bigger problem with addressing oppression through allegory: it just doesn't work. However much people buy your message about the wrongness of discriminating against a made-up group, they are unlikely to extend that consideration to actual oppressed groups. After all, people are very reluctant to take lessons from the real oppression that they actually experience. We have no shortage of sexist black people, racist gays, transphobic disabled people, etc. If allegory between different kinds of oppression worked so well, nobody would need to be reminded to think intersectionally. Moreover, taking a lesson in non-bigotry from a made-up situation requires you to recognize that you are acting in a bigoted way in real life. We're all very invested in believing that we're not bigots. Someone can be waving a Confederate flag and ranting about how Hitler was misunderstood, and they will tell you with a straight face that they don't have a racist bone in their body**. What people need is not help in recognizing that bigotry is bad, it's help in recognizing that what they're doing is bigotry. I get the impulse to address oppression allegorically. Talking directly about real oppressed groups is hard, especially if you're not a member of the group in question. The people you're targeting with your message aren't going to be happy if you don't sugar coat things with allegory. And the people you're trying to help may not be happy -- they may find your portrayal of them is inaccurate and trades in stereotypes. It's easier to write about Zygons than Muslims because there are no real Zygons to complain that you're misrepresenting them. But if the allegorical oppression doesn't lead people to see real oppression differently, then your allegory is wasted. I think Get Out makes a good counterexample here. While the precise mechanism of the oppression (sci-fi brain-swapping technology) was made up, it tied directly into real forms of oppression against the same group. The brain-swapping grew out of, and built directly on, examples of discrimination and racial micro-aggressions that every white person in the audience has done, or at least seen their white friends and family do. (I know I, as a white person, was kind of relieved when the family started just sawing heads open instead of telling Chris how they'd vote for Obama a third time.) The film forces you to empathize with a black person -- a member of a real-life oppressed group -- the entire time. White viewers aren't given an "out" in the form of a white character who ultimately does something good, so that we can think "oh, I would be like that person." It's uncomfortable, but ultimately more successful than a movie about stealing the bodies of aliens or elves would be. *At least mainstream science fiction, which is largely written by people who have not themselves been victims of the kind of oppression they're allegorizing. **As Andrew Ti once said, I feel bad for all these non-racist skeletons trapped in racists' bodies. A standard debate in polyamorous communities has to do with the issue of hierarchy in relationships. Many writers on nonmonogamy assert that relationship hierarchies, in which one partner is considered more important or given some form of priority over others, are wrong or harmful. Explicit defenses of hierarchy are less common, but many people clearly continue to practice hierarchical relationships and would defend their own individual arrangements if confronted with anti-hierarchy arguments. It occurs to me that we might get some insight into the hierarchy debate by turning to Grid-Group Cultural Theory (GGCT), a theory of social organization developed by anthropologist Mary Douglas and her followers. 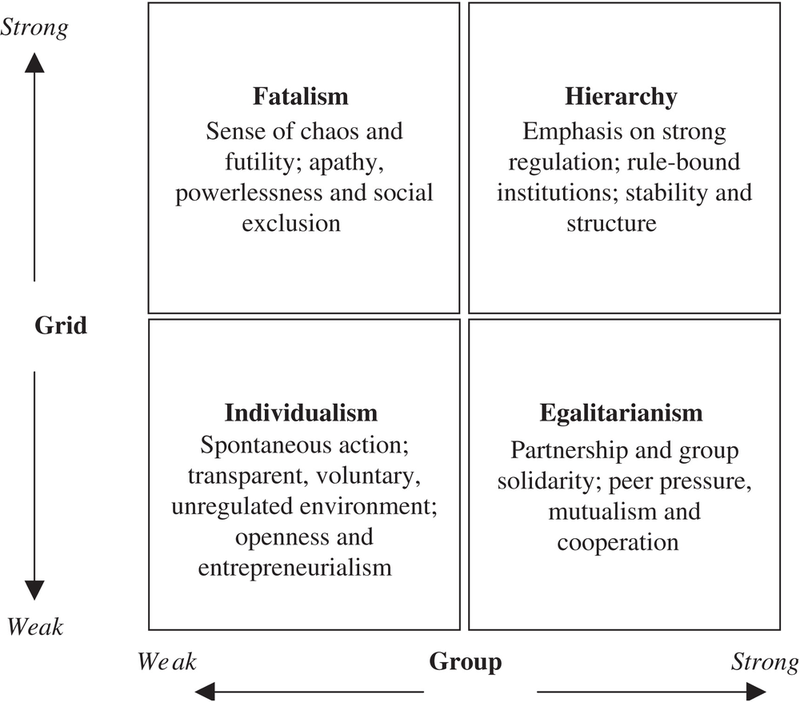 Douglas proposed that social organizations can be categorized based on where they fall on two key variables: grid and group. "Grid" refers to the existence of a system of rules that defines the place and role of each person. "Group" refers to the tendency to elevate the interests and decisions of the collective above those of the individual. If we think of organizations as being either high or low on each of those dimensions, we get a four-fold typology (See here for various diagrams, including the one at right). Each of these four types can be expected to have its own characteristic organizational dynamics, supporting worldview, attitude toward the non-human world, and flaws or pitfalls. A polycule -- a group of people connected by non-monogamous relationships -- can be analyzed as a social organization in GGCT terms. Looked at in this way, it seems to me that there's a good match between "hierarchy" as discussed by polyamorous people, and Douglas's concept of "grid." Polyamorous hierarchies involve the establishment of a set of rules that create differentiated roles for people within the polycule. Consider what it means to have a non-hierarchical -- i.e. low grid -- relationship. There are two basic poles that people seem to be drawn to in order to prevent the emergence of a hierarchy. One pole is a polycule in which all members are equally deeply invested in being a household. In some ways this is much like a standard monogamous relationship, but with more people. Everyone involved is very deeply invested in each other's lives, with lots of shared assets (such as shared living spaces, shared finances, co-parenting, and customized legal arrangements). Everyone involved has some close relationship with each other person (even if not romantic/sexual). Adding a new partner is a rare occurrence and requires lots of work to get the new person up to speed so that they can be equal to the existing members, while leaving the polycule tends to involve painful schisms. The group itself often has a strong identity, perhaps with its own name (something like "the Maple Street House" or "the McSmithingsteins"). We can, with some license, call this the "polyfidelity" model. And it's a textbook high-group, low-grid organization in GGCT terms -- usually labeled an "Egalitarian" organization. You have close integration of members, a focus on the good of the collectivity, and a sharp insider-outsider divide that allows the insiders to be equal (because you can't have everyone be substantively equal unless you know exactly who are included in "everyone"). There may be informal divisions of labor, but there are no formal distinctions of role. So in summary so far: If you wish to avoid hierarchy (i.e. grid) in your polyamourous relationships, there are two basic models, either high-group polyfidelity or low-group relationship anarchy. But what about high-grid relationships? Well, here we have both high and low group options too. And I think a failure to distinguish them contributes to the intractability of the hierarchy debate. Consider first a high-grid, high-group polycule. Because it's high grid, we would see a clear and well-established differentiation of roles, perhaps dividing "primary" partners who live together and share finances, from "secondary" partners seen for less-frequent date nights, and perhaps also "tertiary" friends-with-benefits. And because it's high-group, there is a shared investment in the success of the polycule as a whole. There is a concern for order, clarity, and the management of expectations. "Secondary" and "tertiary" partners respect the authority and greater claims of those above them in the hierarchy. They may not wish a higher position for themselves, or they may get that balance from being "primary" in their own overlapping polycule. (The orderliness of this form of organization alows the differentiation of spheres in which a person can be primary to one partner but secondary to another -- something that would be difficult to arrange in either low grid model.) I think this model is very common in practice, and is what is usually envisioned by defenders of hierarchy. I'll call it "standard polyamory," since it's so common (especially for people who begin to explore nonmonogamy from within an already-established monogamous relationship). Confusingly for our purposes, Douglas and other GGCT scholars call this form of organization -- which is high grid *and high group* -- "Hierarchy." I wouldn't expect a relationship anarchist to be particularly enamored of standard polyamory. But I also think that most of the harshest denunciations of hierarchy in polyamory are actually envisioning the fourth type of social organization -- one that is high grid and *low* group. GGCT scholars almost universally consider this form of social organization to be dysfunctional and undesirable. Here we see rules made to confine people to specific positions in the polycule -- but with those people not being invested in the legitimacy of the overall system. The rules come across as arbitrary, reinforcing the isolation of their targets and their own lack of control over their circumstances. The people who are most constrained by these rules are, obviously, the ones who suffer most from such an arrangement. The plight of the "unicorn" -- a woman brought in to serve the needs of an existing m-f couple, subject to various restrictions such as not dating others, only sleeping with the other two together, etc -- is iconic here. But even the rule-makers can suffer from a low-group high-grid situation, as they find themselves in the role of suspicious enforcer rather than honest partner. GGCT scholars label this form of life "Fatalism," which evokes the type of mentality that is cultivated by being in such a situation. A fatalist must renounce the ambition to exert control over their own situation, and instead learn to roll with the vagaries of good and bad that come their way. An ISIS-supporting immigrant runs down pedestrians in New York, killing eight. A white man in Texas opens fire in a church, killing 27. And partisans on both sides gleefully point out their opponents' hypocrisy -- they were quick to draw political conclusions from one of these incidents, while warning us not to politicize tragedies after the other. There is certainly hypocrisy enough to go around on both sides of the aisle, but people of good will seem to agree that it would be possible to have a consistent, content-neutral standard for what constitutes politicizing a tragedy. By that standard, you could recognize when your opponents were or were not drawing legitimate political conclusions from a tragedy even when you didn't agree with them. But I'm not so sure. To see why, we need to have a clear idea of what it means to improperly politicize a tragedy. On the one hand, it seems obvious that it's possible to crassly wield a tragedy for political gain, so there are some political connections that should be ruled out. On the other hand, it also seems obvious that we should be able to examine tragedies in order to come up with strategies -- including ones involving policy changes -- to prevent them from happening again. It seems that improper politicizing of a tragedy then means linking it to political conclusions that are themselves inappropriate -- that is, conclusions that don't really follow from the tragedy. The wrongness of politicizing a tragedy consists in demonstrating that you care more about the political agenda you're attempting to advance than you do about the victims of the tragedy. Now, here's the rub: you can't determine whether a political conclusion drawn from a tragedy is inappropriate without evaluating the substance of that conclusion. And that evaluation is going to be shaped by your political stance. Liberals see calls for gun control after the Texas shooting as legitimate, and thus not "politicizing," because within a liberal framework, gun control is an entirely sensible solution to what happened. But within a conservative framework, gun control is illegitimate -- both wrong on the face of it, and inappropriate as a solution to the specific incident in Texas. From this point of view, calls for gun control must inevitably seem like inappropriate politicization. There's no way to judge whether saying "the Texas shooting shows the need for gun control" is illegitimate politicization or not, aside from making a judgment as to whether the Texas shooting really does show the need for gun control. Therefore, one's ideological opponents are always going to look like they are illegitimately politicizing tragedies, because they will always be proposing political conclusions that you think are illegitimate. Only the rightness of their proposed solutions could justify linking them to the tragedy, but you already know their proposed solutions are wrong. A further implication of this way of thinking is that drawing political conclusions from tragedies will have limited effectiveness. Everyone likes to believe that tragedies are clarifying moments, events whose implications are so clear that they break through the walls of ideology and make your conclusions obvious to anyone but the worst partisan hacks. (This is why we imagine we can have an ideology-neutral standard for politicization.) But ideologies are flexible and adaptable. They can easily interpret a wide variety of events in ways that don't disturb their basic premises and political commitments. This is especially true for types of tragedies that occur repeatedly -- such as Islamist vehicle attacks or mass shootings with high-powered weapons. There is no reason to think that this tragedy is going to be the one that somehow finally convinces your opponents to see the error of their ways. There has been an outpouring of discussion on the left about the moral justifiability of punching (or otherwise physically assaulting, but punching seems to be the go-to) Nazis ever since Donald Trump won the presidency, and it's seen an unsurprising uptick after the events of Charlottesville. Lots of energy has been poured into the debate on various social media platforms, but the overwhelming majority of it is not serious discussion. It's just posturing to make the participant feel virtuous. Consider first the anti-punchers. They give us high-minded dissertations on the virtues of non-violence, of not "stooping to their level," of maintaining the moral high ground. But how many of these people would have punched a Nazi if they did think it was justified? I suspect not many. These are not people holding themselves back from Nazi-punching temptation on the basis of moral principle. They're cowards afraid to get involved in a physical fight, who are cloaking it in fancy language to make themselves feel virtuous for not doing something they wouldn't have done anyway. And hey, I'm a coward about physical fights too. But I don't present it as a demonstration of my moral virtue. And then there's the pro-punchers. They too talk a good game -- about the necessity of responding to inherently violent ideologies, about the privilege inherent in non-violence, and so forth. 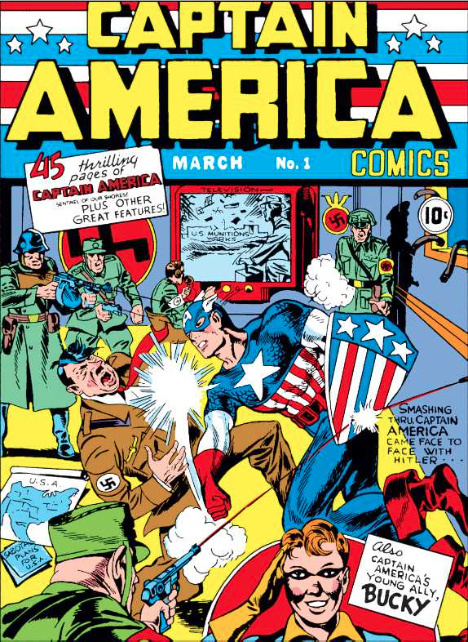 They share comic book panels of Nazis getting punched, and that one video of someone clobbering Richard Spencer, and Twitter threads about how to punch effectively. But they too are not out there actually punching Nazis. While pro-punching memes rack up hundreds of thousands of shares and likes, I can count on one hand the number of Nazis who have actually gotten punched by a leftist since the election. Hundreds of Nazis came to Charlottesville last weekend. 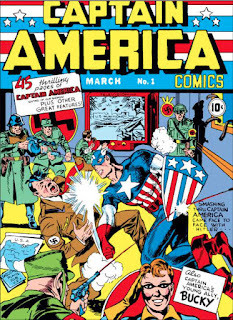 It was a target-rich environment for anyone wanting to punch a Nazi. But how many of them actually got punched? And OK, maybe taking on a heavily-armed mob is too dangerous. But they marched around un-hooded, so people have managed to determine the identity and personal information of many of them. And yet they still went largely un-punched. Nobody walked into Top Dog to clobber Cole White. The big anti-Nazi victory of the last few days was using social media to shame Top Dog into firing Mr. White. So I can only conclude that pro-punching people aren't actually planning to punch any Nazis. They just want to feel tough and fantasize about literally striking a blow for justice. Most pro-punching discourse is a combination of ally theater and social justice masturbation. So I don't have time for the Nazi-punching arguments on either side. Come back when some non-negligible number of Nazis is actually getting punched, and then I'll care whether it's morally justified. The big lesson here is, as I've written before, that the more you -- justifiably! -- hate Trump, the more vulnerable you are going to be to clickbait. I could rehearse all of the usual lectures about fact-checking and paying attention to your sources here. But even that, I think, doesn't go far enough. Clickbait can come from any source. Folks on the left generally regard Maddow as a credible, quality source. But even she is, ultimately, in the business of selling your eyeballs to MSNBC's advertisers. The real defense against anti-Trump clickbait is to give up on the myth of the Big Reveal. What made Maddow's promise so sensational was the hope that Trump's taxes would be the Big Reveal, the piece of information that finally confirmed what we all suspected, and made it incontrovertible to our opponents. Trump's perfidy would be laid out in black and white, and we could feel satisfied at being vindicated, while the floor fell out from under his supporters. It's the hope of the eucatastrophe -- just when things look darkest, to hear Maddow shout "the tax returns are coming!" The Big Reveal makes a good dramatic climax to a movie. But real life doesn't work that way. Remember the Billy Bush tape? We all thought that was going to be the Big Reveal that took Trump down. In reality, it dinged him a few points in the polls for a couple weeks, then he bounced back. The Big Reveal only works if we're all living in the same world. But we're not. Liberals and conservatives are working from such different starting premises, such different sets of basic values and basic frameworks about how the world works, that no one piece of information can make everything change. That doesn't mean that the situation is hopeless, or that getting more information (including the rest of Trump's tax returns) is useless. But it does mean we can't hope for one big piece of information to suddenly change everything. What will change things is the long, slow process of shifting people's basic value systems and worldviews. Once we set aside the false hope of the Big Reveal, we won't be as easily taken in by clickbaiters dangling it in front of us. Donald Trump is in the news again for ordering an expensive steak well-done, a longstanding culinary preference of his. Some observers have been content to simply mock him, while others have written long pretentious not-sure-if-it's-satire-or-not personality analyses based on his eating habits. It's the kind of thing that would be shameful if applied to anyone we didn't already hate. Some people have pointed out that it's not just urban liberal foodies who like their steaks raw -- bloody steak is also the official Real Red-Blooded American Man way of cooking. So how can it be that Trump, champion of the rural working class, can get away with well-done steaks? I think the answer can be seen when we contrast Trump's style with George W. Bush's. Bush made a great effort to portray himself as one of the people, a regular Joe, the guy you want to have a beer with. He came from Texas (the most American of the states), spoke with a drawl, and spent his vacations clearing brush on his ranch. And he portrayed John Kerry as just the opposite cultural type -- a windsurfing, swiss-cheese-chessesteak eating coastal elite. And it seemed to work! Gallons of ink were spilled by left-leaning commentators analyzing Bush's affected populism. Then along comes Trump. Trump set himself up as the champion of the white rural working class -- but he never made any pretense of being one of them. Where Bush presented himself as a brush-clearing, drawling, reg'lar guy Texan, Trump flaunted his wealth and spoke with a yuge Brooklyn accent while hanging out in his gold-encrusted New York penthouse. There's a certain weird authenticity to the way Trump doesn't seem to care if he looks like one of the people he represents. I don't think Trump's taste for well-done steak is an act. I assume that really is how he likes it. (And I can sympathize -- before I became a vegetarian, I preferred my meat well-done too.) But it shouldn't be a surprise that good old bloody-steak-eating heartlanders wouldn't be turned off by Trump's culinary tastes, since he's never claimed that his personal lifestyle is normal. This work is licensed under a Creative Commons Attribution-Non Commercial-Share Alike 2.5 License. Calling milk "secretions" is currently in the Kiosk.